SOCHI, Russia (AP) It took an angry-looking bird to get Brazilians hooked on their World Cup mascot. 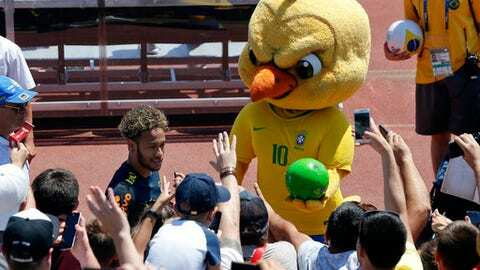 The team’s new mascot – a yellow canary with an angry face that represents some of the fans’ frustration after having lost the World Cup at home four years ago – has become a huge sensation everywhere it goes in Russia. The bird, always dressed in Brazil’s traditional yellow and blue uniform, resembles an angry-faced Tweety, the Looney Tunes character from Warner Bros. It boasts a ”bad boy” attitude and a tough-looking walk, contrasting to the cute image of the unpopular canary that had always represented the national team. Brazil historically never fully embraced the tradition of mascots in sports, but things changed when the Brazilian soccer federation – inspired in part by Chicago Bull’s ”Benny the Bull” – turned its nice little canary into a mad-looking figure to try to bring fans closer to the ”Selecao” ahead of the 2018 World Cup. The idea was to give the mascot a look and demeanor that would bode well with a younger generation, and the canary has a similar personality as the one displayed by Benny the Bull, which became popular in the United States for trolling fans and taunting opposing players during games. The angry-looking Brazilian mascot, created in late 2016, also became popular outside of the realms of soccer, as it represents the population’s overall dissatisfaction in a country facing an ongoing political crisis, increased violence and unstable economy. The federation tried to use a mascot with a nicer face in social events last year, but it quickly had to give up on the idea because everyone kept asking for the meaner-looking mascot. The new canary is not allowed to appear in matches in Russia because of FIFA’s rules protecting the official World Cup mascot, Zabivaka the wolf, but it accompanies the Brazilian squad almost everywhere it goes, appearing outside stadiums before matches and in some training sessions. The canary was already in Kazan ahead of the team’s match against Belgium in the World Cup quarterfinals on Friday. Fans loudly chanted the mascot’s name as they waited for Brazil players to arrive at the team’s hotel for a recent game in Moscow. They went crazy when security guards – apparently thinking the mascot was a supporter trying to sneak in – took it away from the reserved team area in front of the hotel. The canary didn’t think twice and joined the partying fans, playing the drums with them and taking dozens of selfies before being allowed back inside after a quick intervention from Brazilian officials. The mascot, which already has hundreds of fake profiles on social media, also often displays its good soccer skills by doing kick-ups to impress fans. The federation doesn’t officially call the mascot ”Canarinho Pistola,” sticking only to ”Canarinho,” but it basks in the popularity of the character’s unruly demeanor. It constantly uses the mascot’s image on social media and promotes it every chance it gets. The canary has already made appearances in television shows and toured some of Russia’s most famous locations where Brazil has played. Players also have embraced the team’s new rowdy mascot. Stars Neymar and Philippe Coutinho had plenty of fun playing a prank on the bird during a training session last year, when Neymar sneaked behind the canary and Coutinho pushed it back against him. And fans loved it, just as they’ve been loving their new angry-looking World Cup mascot.